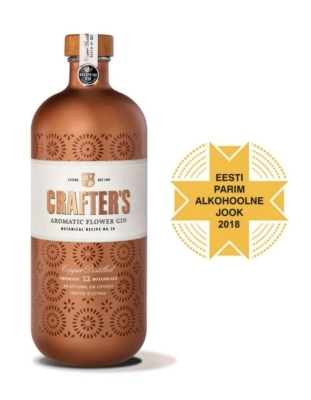 Crafter’s Aromatic Flower Gin, the colour-changing craft gin produced by AS Liviko, was named the best alcoholic drink of 2018 in the Best Estonian Food competition. Liviko started producing Crafter’s Aromatic Flower Gin last autumn and now exports it to 16 countries. The extract made of rosehip petals contains natural pigment, which gives the gin its copper colour. The pigment in rosehip petals reacts to changes in the pH level with changes in colour. When tonic is added to Crafter’s Aromatic Flower Gin, then its colour changes to pink in the acidic environment. Crafter’s Aromatic Flower Gin contains 12 carefully selected aromatic herbs. Various sweet blossoms can be felt in the flavour bouquet of the gin, which is distilled in a copper vat. The sweetness of the gin is balanced by the crispness of juniper berries and the freshness of citrus fruits. To make the colour-changing cocktail Crafter’s Aromatic Flower Signature, start by filling the glass with ice. Pour Crafter’s Aromatic Flower Gin and tonic in the glass. Mix thoroughly to make the cocktail turn pink. Decorate with an orange slice.